​Here are a few examples of projects I've worked on and products I am proud of. Check back from time-to-time to see the most recent endeavors​. Every year FIRST publishes a manual detailing the game that participants will play. As you might imagine a large volume of questions are generated by participating teams. FIRST needed a structured way to collect these questions and publish official answers. We built a modern web application using the Meteor web application framework to replace their legacy system. 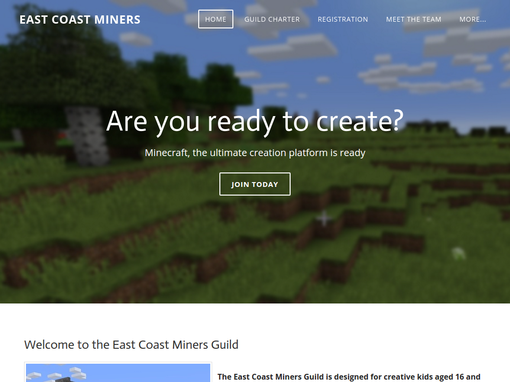 East Coast Miners is a project that was spawned out of the need for a structured place for middle school aged kids to learn to collaborate and build together in a safe online Minecraft environment. East Coast Miners is the brainchild of Mary O'Brien and Kim Harrison. Mary and Kim are educators who are fascinated with ways to integrate technology and education. Benjamin Carlson and I designed and built an easy to use web connected controllable outlet as our senior capstone project. The system provides users an easy to use web dashboard to monitor energy use of appliances in their home. Dr. Glen Davis PhD. contacted me about a website for his business. He needed a low cost solution that would be easily maintainable for him and his staff as their business grows. The Infinite Loop Robotics team needed an active and engaging website to compete in the FIRST website award as a part of the FIRST robotics program. We designed a site and an administrative backend for team members to use to manage the team. See OTIS on the Projects page. The Friends of the Belgrade Public Library contacted us in need of a website to coordinate their fundraising efforts and provide information to the community about their upcoming events. We provided them a simple elegant website which can be easily maintained. The Friends of the Belgrade Public Library also needed some architectural design plans for their proposed renovation. We provided mock-ups using Google Sketchup as they worked with their contractor to plan and execute the remodel. See our ISTE Builds as well.